Today marks the first in the Encounter Table's monthly "spotlight" series, focusing on a settlement or site of interest in Golarion that has not received an official gazetteer entry. This series is designed to provide Gamemasters with all the information they need to run adventures at the spotlight site and to integrate the spotlight location with any established lore. This month's spotlight, the city of Senara, comes to us courtesy of fan commentary and request. Take a look below and let us know what you think of this article series and what you'd like to see explored next in the Encounter Table's spotlight! Situated at the fork of the River Iseld and the River Malvesa, Senara lies within the dangerous borders of the Whisperwood in the heartlands of Cheliax. Bordered to its east and south by water and its north and west by dense forest, Senara is largely isolated from the rest of Cheliax, save for intermittent boat traffic between Remesiana to the southwest and Misarias to the east. Neither settlement travels frequently along the waters the divide the Whisperwood, for fear of being waylaid by the beasts within its shadowy canopy. Senara is, therefore, left to fend for itself and the old city represents that isolation and self-reliance in its unorthodox governance and peoples. The settlement that became Senara began in 3077 AR when the region was settled by Taldan miners. The original village of Senara was little more than a series of wooden shacks surrounding a gypsum mine along the riverbanks where the Iseld meets the Malvesa. The miners soon discovered that Senara sat upon an enormous volcanic hot springs and hundreds of miles of natural caverns descending deep below the ground. Tales from expeditions into the mines spoke of gypsum crystals as big as a house piercing the caves like gigantic crystalline spears. Others spoke of strange sounds and hallucinations from deep within the lightless depths. In 4088, during the Even-Tongued Conquest, Taldan saboteurs attempting to damage the Chelish economy collapsed the entrance to the Senara mine and claimed the lives of two dozen miners. Further skirmishes between Taldan forces and the Chelaxian military ultimately led to the people of Senara abandoning the town to escape the hostilities. Senara would lay abandoned for centuries, until in 4555 when a lumber consortium from the western Whisperwood settlement of Longacre resettled the area and reopened the gypsum mine. Workers coming from neighboring towns and gold flowing in from the capital led to a resource boom in the Chelish heartlands with Senara at its center. To commemorate the official founding of Senara, the temple of Erastil was constructed around one of the city's volcanic hotsprings in 4556. Construction on the temple of Aroden began in 4557 and was completed on the 1,500th year since the region was settled by Taldan explorers in 4577. Senara's boom times were not long-lived, however, and a catastrophic collapse of the gypsum mine in 4590 killed nearly two-hundred workers and flooded the eastern portion of the city. The mine was swiftly flooded by water from the river and this flow caused a sinkhole to swallow the eastern portion of Senara into the ground, collapsing a large portion of the hill the city rested atop and forming mud flats that remain to this day. Adding to the injury were increasingly deadly incursions of monsters from the Whisperwood that thinned the number of Senara's militia by the day. By autumn 4592 the lumber consortium left Senara entirely and headed east and the city's population dwindled to less than 200. Longtime residents stubbornly remained in Senara, and while its population ebbed and flowed over the years, it would be never truly recover. In 4603, by order of King Gaspodar, members of the Hellknight Order of the Scourge were broken off to form the Order of the Pike. This splinter order of the Hellknights served a singular purpose of defending the Chelish heartlands from the increasing danger of monsters emerging from the Whisperwood. Choosing Senara as the site for their citadel's construction, the Order of the Pike had the gallows atop Alabaster Hill demolished and the cemetery there moved. Construction on the tower of Ordeial began in 4603 and was completed but two short years later. With the arrival of the Order of the Pike, Senara's militia was bolstered by the Hellknights and the people of Senara once more knew safety, even if for a short while. The death of Aroden in 4606 devastated Senara. The city's high priest of Aroden, Alren Renzan, was murdered in a fit of madness by the priestess of Pharasma named Ioseith Lorein who later threw herself from Alabaster Hill to her death. The coming turmoil of the Chelish Civil War and the rise of House Thrune saw Senara and its people hunkering down in relative safety. Though a few skirmishes threatened the city, Senara weathered the coming decades of conflict due in part to its geographical isolation and strategic unimportance. Through the entire ordeal, the Order of the Pike continued to rage across the Whisperwood to defend Chelish settlements from native monsters who traveled further and further from the forest during the aftermath of Aroden's demise. The worst damage dealt to the people of Senara during the civil war was a subtle one. 4606 AR marked the beginning of a population boom of tieflings throughout the Whisperwood region, centered in Senara. It began as one or two pregnancies a year, gradually escalating to the more than fifty percent birth rate of tieflings seen in modern-day Senara. It was becoming increasingly clear to its people that the increase in tiefling births was an unnatural occurrence. However, the Order of the Pike managed to keep the peace up until an unexpected turn of events in 4638. Under orders from the heartland, the Order of the Pike was forcibly disbanded and reintegrated into the Order of the Scourge to assist in the final push of the civil war. All members of the Order of the Pike were removed from Senara and the tower sealed. In the wake of the Hellknight exodus, the Senaran militia struggled to contain the distrust and conflict brewing between the city's tiefling and non-tiefling residents as birth of tiefling children continued to escalate. The animosity and distrust came to a head in the summer of 4639 when a tiefling was blamed for a fire that claimed three homes in Riverside and the lives of eight Senaran residents. Though promised a fair trial, the tiefling was run through a mockery of a court and summarily hung from the city's palisades. This execution spurred on a riot that left dozens dead and a quarter of Senara on fire. The riots came to a close on their third day thanks to the efforts of the Pharasmin oracle Fianna Ru'am working in cooperation with the Iomedean clergy The two put themselves in harm's way between the racially divided lines in order to negotiate a truce. An agreement was made between the government of Senara and its tiefling residents that a "temporary" settlement would be made on the outskirts of Senara in order to protect the tieflings from further intolerance by the locals. 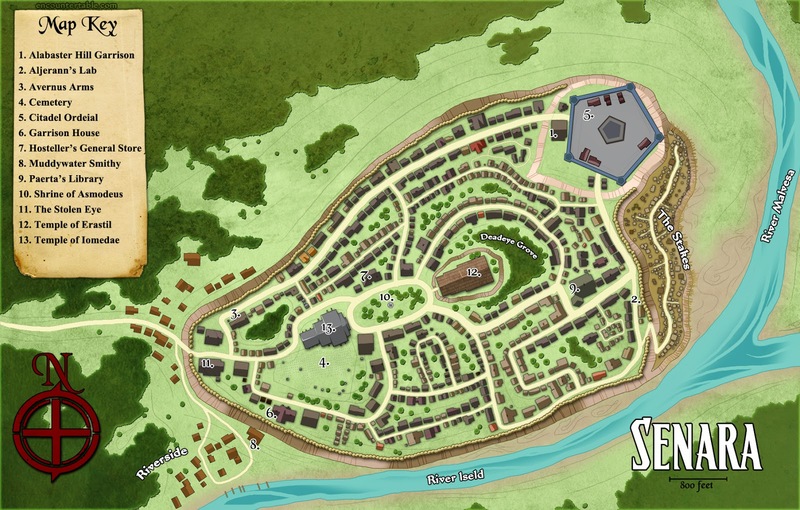 The tiefling settlement in Senara would be constructed in 4640 on the city's crumbling eastern face, the site of the gypsum mine collapse centuries earlier. A makeshift stakewall constructed on the muddy east slopes bristled against the dangers of the Whisperwood and a hastily constructed shanty town became home to the nearly three hundred tieflings that survived the riots. What was supposed to be a temporary settlement for the tieflings quickly became their permanent residence as legislation passed by Senara's mayor condemned any and all tieflings born in the city to "protective habitation" in the Stakes, as it had come to be known. Most of Senara's tieflings were uneducated laborers working in forestry or fishing and were unable to effectively represent their peoples' plight in town hall meetings regarding the forced segregation. While the overall situation in Senara was less than ideal, a relative peace had been established that became the precedent for the next several decades. In 4688, nearly four decades after the conclusion of the Chelish Civil War, the Order of the Pike was reinstated and its members—once more drawn from the ranks of the Order of the Scourge—returned to Senara. Tensions between the people of Senara and the Hellknights were high, due in no small part to the order's effective abandonment of Senara and the decades of racial tension that followed dividing the city. Worse was the constant friction between the order's Lictor and the captain of the Senaran militia over jurisdiction and governance. Many Senaran citizens were displeased to see the Ciradel Ordeial reopened and the black-clad knights walking their streets, but the effectiveness of the monster-hunting order in driving back the native creatures of the Whisperwood returned a semblance of normalcy to the troubled city. In order to help bridge the gap between the citizens of Senara and the Hellknights, Fianna Ru'am petitioned to join the Order of the Pike. Her confirmation before Lictor Ghaldurn was swift and decisive and before the end of winter in 4688 Fianna had become the order's first signifer. The unexpected death of Lictor Ghaldurn during an expedition into the Whisperwood in 4703 created a vacuum within the order's power structure. Young, healthy, and strong, no member of the Order of the Pike expected their Lictor to fall in the line of duty and no clear replacement had been groomed from within the recently reestablished order. Ultimately the contentious decision was narrowed down to two candidates—Tolsis Tuvadorn and Val Athraden. Both of the rank of Master of Blades, these skilled warriors competed in a week-long series of physical and mental exercises to establish dominance and leadership skills and was arbitrated by the acting Lictor, Signifer Fianna Ru'am. Realizing that she would likely emerge victorious, Tolsis intentionally failed a critical final assessment in order to concede her appointment as Lictor to Athraden. Tolsis' intention was to ensure a human sat at the head of the order for the betterment of relations between Senara and the Hellknights. Tolsis' generosity and forthrightness earned great respect from Athraden and the two have shared a strong bond since. In the years that have followed, the Order of the Pike focused most of its efforts on ranging across the Whisperwood and north to Isger in adherence to their mandated task of protection against the beasts of the wilds. However, the growing tiefling population and the worsening relations between they and the citizens of Senara seriously troubled Lictor Athraden. In 4708, when residents of Senara began reporting occurrences of bewildering nightmares and waking hallucinations, blame was immediately shifted onto the tiefling population. Most frustratingly to the Order of the Pike, members of the Senaran militia were among those pointing fingers at the tiefling residents, blaming them for the supernatural goings-on. Word eventually got out that the militia was planning a night raid on the Stakes to round up and execute tieflings baselessly accused of causing the nightmares. In response, Lictor Athraden put the Order of the Pike into action and preemptively raided the garrison of the Senaran militia, arresting its captain and members of the militia who orchestrated the attempted raid on the Stakes. Overnight, the Order of the Pike disbanded the Senaran militia and placed the city under martial law, appointing itself a military dictatorship until such a time as peace has been restored. The city's resident council was also summarily disbanded, and Mayor Jothran Hourne remanded to his estate and forbidden from performing in official capacity until martial law ended. In the years that have followed the establishment of martial law in Senara the Order of the Pike received official sanctions from Ergorian to hold martial law until the source of the supernatural occurrences in the city could be established and was neutralized. To aid in the endeavor, Queen Abrogail appointed renowned diabolist Erseth Paerta to advise the Order of the Pike in researching the source of both the troubled dreams and the tiefling population boom. Alabaster Hill: The highest point of elevation in Senara, Alabaster Hill is a craggy and barren outcropping of granite flecked with gypsum, giving it a pale coloration that contrasts against the black stone of the Hellknight fortress set atop it. When Senara was a Taldan lumber colony, Alabaster Hill was the site of the town's gallows and original cemetary. It is uncertain if the Order of the Pike moved all of the corpses when they constructed their citadel, or merely moved their headstones and claimed the corpses for another purpose. Alabaster Hill Garrison: Constructed in 4603 and decommissioned by order of the Hellknights in 4708 this sturdy stone building served as home to Senara's militia for over one hundred years. Since the disbanding of the city's militia, the garrison has become a meeting ground for the Order of the Pike's leadership and the townspeople of Senara during martial law and military rule. Few meetings are held here, leaving the once busy garrison empty more often than not. Aljerann's Lab: The run-down wood and stone lodge on the edge of the Stakes was once the site of the Senaran Pathfinder Society Lodge. When the Chelish Civil War erupted in 4606 the Pathfinder Society halted construction on the lodge and pulled its agents from Senara, leaving the building to fall into disrepair. In 4709, traveling alchemist Aljerann Duskwhisker (N male ratfolk alchemist 5) purchased the unfinished building for a paltry sum, converting the lodge's basement into a laboratory while leaving the upper half unfinished. Aljerann began his own investigations into the exploding tiefling population in Senara, believing—incorrectly—that chemicals spilling out from the city's sewers may be to blame. Avernus Arms: Situated on the northern edge of Senara, Avernus Arms is the oldest blacksmith still in service in Senara. Originally known as Aroden's Arms and maintained by members of the temple of Aroden, the smithy was abandoned after the gypsum mine flood in 4590. When the Order of the Pike returned to Senara in 4688 the blacksmith was reopened under demand of the Lictor. Since then, Avernus Arms has maintained a strong alliance with the Hellknights and services all of Senara with fine weapons and armor. Its current owner and proprietor, Falgrum Hroshek (N male human (ulfen) expert 7) harbors a particularly dark secret—his wife Yngrid gave birth to a tiefling son in the spring. Falgrum told the townspeople that his son was stillborn and has been keeping the child a secret in the attic, though he is well-aware that the secret may yet come out and his child will be taken from him and forced to life at a shelter with an adoptive family in the Stakes. Falgrum wants to send his son away with a traveler to life free outside of Senara, but his wife is cold to the idea and refuses to acknowledge that the alternative is growing up in a violent ghetto. Senara Cemetery: Originally set atop Alabaster Hill, the Senara cemetery was moved to a lot adjacent to the temple of Iomedae in 4603 when construction on Citadel Ordeial began under guidance by the Pharasmin priestess Ioseith Lorein. Following Lorein's suicide in 4606 on the day of Aroden's death, the cemetery was tended by the city council with middling attention. After visiting Senara in 4636 and seeing the poor condition of its cemetery, the half-elven oracle of Pharasma Fianna Ru'am offered to settle in the city and take care of its dead. Maintaining a small shrine to Pharasma within the temple of Iomedae, Fianna leads a small collection of Pharasmin priests in performing all funerary and burial services in the city, though since joining the Hellknights she has split her time less evenly and left much of the day-to-day management to her longtime friend Osrich Ethaiel (N old male human adept 6). Citadel Ordeial: Constructed over three yearr, beginning in 4603, this ancient tower rises black and jagged from the peak of Alabaster Hill. Citadel Ordeial is surrounded by a five-sided stone bailey and patrolled by armigers around the clock. Five ballista mounted on the corner towers of the bailey have rarely been called upon in defense of the city but are kept in prime working order in the event that the city come under attack. The citadel has remained under Hellknight control since the order's founding, though when the Order of the Pike was disbanded during reorganization amidst the Chelish Civil War, many members were sent to integrate with the Order of the Scourge, though some members of the Order of the Pike refused to cease operations and worked as a mercenary troop in Isger, sellings services under the monicker of the Order of the Pike. In 4668 the order was once more officially recognized and the citadel was reopened. Citadel Ordeial rises twelve stories above Senara with an additional five basement levels containing prison cells and conjuring halls for binding devils. Most notably, the fifth basement level also contains a sealed entrance to natural gypsum caves below Senara originally dug into during the tower's creation. The iron door to these caves has been under arcane lock ever since due to concerns of the gypsum caves potentially connecting to the Darklands. The Garrison House: Something of a misnomer, this two-story wooden lodge parked on the banks of River Iseld no longer serves its named purpose. Once a garrison that housed Senara's fledgling militia in its early years, the garrison house was purchased by a private landowner when the Alabaster Hill Garrison was constructed in 4605. Now Senara's largest inn and tavern, the garrison house services travelers with hearty meals and warm beds under a decoratively militaristic atmosphere. War banners hang from the rafters, old suits of armor rest on wooden mannequins, and battered shields adorn the walls. Garrison House is owned by Pychek Halmis (CN middle-aged male human commoner 3/warrior 2), a retired member of Senara's disbanded militia. Pychek holds resentment towards the Order of the Pike for absorbing Senara's militia into its own ranks and—in his eyes—stealing the town out from under its citizens. He has attempted to refuse service to the Hellknights and has been intimidated and strong-armed into accepting their patronage every time, growing his frustration and resentment. Hosteller's General Store: This large wooden structure near the heart of Senara overlooks the town square and serves as both general store and inn to travelers from outside the city. The building's ground floor is a sprawling store selling traveling supplies and other gear essential for surviving the wilds of the Whisperwood. The general store's second floor is a spacious inn of good quality catering to the needs of adventurers and other hardy travelers. Hosteller's owner, Auris Leclair (NG female elf expert 9) maintains a steady stock of antitoxins and other alchemical remedies to stave off disease or infection from the creatures native to the Whisperwood. Having known of Aljerann's presence in the city, Auris is looking to establish a business deal with the alchemist in return for access to his crafts. However she has been stonewalled at every turn due to the ratfolk's obsession with solving the mystery of the tiefling population boom. Muddywater Smithy: The proprietor of the Muddywater Smithy is a blacksmith of little renown, Lothan Wodris (LE male human expert 2). Lothan was approached recently by the tiefling Wuthrud to fill an order for weapons and armor that Wuthrud intends to use in an uprising against the city of Senara. Paying for the arms in both gold and illegal goods smuggled in from the river, Wuthrud is hoping that Lothan's loose morals and greed keep his mouth shut until the tiefling insurrection begins. Lothan is content to uphold his end of the bargain by forging common quality weapons and armor for Wuthrud, but is unaware that when the revolution comes, his head will be joining the other humans' on the pikewall of the Spikes. Paerta's Library: Originally a modest single-family home in Senara's east side, the building was renovated in 4709 on arrival of the Imperial Diabolist Esreth Paerta (LE female human wizard 5/diabolistBotD1 2). Esreth has since converted the home into a library and laboratory, importing her research from Ergorian to work with the Order of the Pike in uncovering the source of the city's tiefling population. While rumor persists that the Scar Thicket in the western Whisperwood is a gate to Hell, Esreth insists that the notion is a confusion of ancient history dating back to the original Taldan founding of Cheliax. She believes that Senara itself sits atop a doorway to the Darklands of Nar-Voth, if not some sort of planar crossroads. Recently made aware of the sealed door in Citadel Ordeial that leads to the caves below Senara, Esreth is working to put together an expeditionary force to explore the caverns and test her theories. Lictor Athraden refuses to send Hellknights into the cave without further research, but is open to the idea of Esreth out-sourcing the initial scouting party to mercenaries or adventurers. The Stakes: The full-to-bursting ghetto for Senara's tiefling population, known as the Stakes, is the city's deepest shame. Given its name for its close proximity to the spiked palisade walls of the city's eastern border, the Stakes is a network of narrow alleyways and ramshackle wood and brick houses in wet lowlands that lie deep in Senara's shadow. Drainage from the city's ancient sewer system spills out here, filling the streets with inches of foul, murky water during the spring and fall. Disease and crime is rampant in the Stakes, though Hellknight patrols do their best to keep both of these undesirable elements contained to this neighborhood. While tieflings are allowed to travel freely in and outside of Senara, they are not allowed permanent residence anywhere in the city other than the Stakes. Furthermore, the bigotry and distrust leveled at the tieflings by the city's residents makes them unwelcome in most other parts of Senara. While foreign tieflings are tolerated, locals do little to hide their disdain and seek to urge them out of the city as soon as possible. Prior to the boom of tiefling births beginning in 4606 AR the Stakes was a rocky mud flat resulting from the collapse of eastern Senara during the gypsum mine collapse in 4088. This site served as Senara's dumping site for garbage of all manner, but as demand for a tiefling "district" grew with the ever-increasing population the decision was made by the then-mayor of Senara to fill in the mud flat and build "temporary" shelters for the city's tiefling residents. Senara's tieflings were moved "for their own protection" into the Stakes until a relocation site outside of Senara could be built. Temporary turned into permanent, and the tiefling of ghetto became a shameful fixture of the rural city. An ever-shifting collection of street gangs and thugs rule the Stakes, often leading to escalations of violence that end in bodies littering the street and a shift in power. The tiefling residents had little say under the rule of the Senara city council, and even less now that the Order of the Pike has taken over the city. However, rumors of an attempt at organizing the gangs and thugs of the Stakes into a "people's army" to fight for tiefling equality have been growing and the Order of the Pike is putting greater scrutiny on the comings and goings down in the Stakes. The Shrine of Asmodeus: This open-air shrine to the Devil God Asmodeus sits at the center of a sparsely wooded field at the heart of Senara. The shrine is a circular granite base atop which a with a five-sided marble plinth rises up twelve feet. Crowning the plinth is an iron star of Asmodeus that has not tarnished or corroded in the slightest since its erection in 4640. The shrine's biggest attendants are flocks of birds that perch atop the star and the plinth during daytime hours. Few people in Senara venerate Asmodeus, but Chelish law mandates the shrine's presence. The Stolen Eye: Senara's newest and second-largest tavern and inn sits squarely inside the Bulwark Gate, readily waiting to accept travelers from western Cheliax. The red-painted ovoid shingle announcing the inn's name in gold leaf is homage to an enormous gemstone once said to belong to the owner of the inn, Graiden Horst (N middle-aged male human bard 5/rogue 2), a retired adventurer and treasure hunter. According to the tale—one most locals have heard—Graiden once scaled a twenty foot tall bronze idol somewhere in the Sodden lands to pry out one of the shield-sized rubies set in its eye sockets. While Graiden claims the stone was stolen by former allies long ago, most longtime residents of Senara believe it is a fabrication created by the bard to help build the identity of the tavern. Directly competing with the Garrison House and Hosteller's General Store, Graiden has taken to the Order of the Pike, offering them discounts on meals and drink in an attempt to curry favor with the order without outright bribing them for influence—an act that would be taken poorly by the Hellknights. While Graiden is not a Chelaxian patriot (and in fact hails from somewhere in Isger, if that story is to be believed), he puts on an act of being a proud Chelish citizen in order to engender himself to the locals and the Hellknight authority. Temple of Iomedae: Positioned across the town square from the temple of Erastil, with the shrine of Asmodeus wedged between them at the square's center, the temple of Iomedae rests on a precarious balance between ancient Chelish traditions and the new heritage of Diabolism. Housing only a small collection of eight priests led by Father Osras Gavorn (NG old male human cleric 4) the temple visibly promotes Iomedae with her iconography and sacred colors while still containing a small shrine in Aroden's memory adjacent to a shrine to Pharasma. A once extant shrine of Milani was removed in 4789 at the request of the Order of the Pike. Temple of Erastil: One of the oldest buildings in Senara, the temple of Erastil is an enormous wooden lodge of Ulfen architecture made entirely of freestanding timbers. Situated on a rocky knoll overlooking the town square, the temple boasts an a-frame roof and antler adornments, casting a long, jagged shadow across the shrine of Asmodeus during early morning hours. The temple is built around a sacred hot spring dating back to the long forgotten tribal traditions of pre-Taldor Cheliax, legend to be formed from the tears of Erastil himself, shed during some ancient tragedy. Born into indentured servitude to a minor noble family in Ergorian, Val Athraden fought for much of his life to attain the position and importance he now possesses within the Hellknights. As a boy he worked as a dockside laborer in Ergorian's harbor, and it was here that he had his first encounter with the infernal. During the unloading of lemure devils transported to Ergorian from Westcrown, Val was present for a catastrophic fracturing of the binding seals that kept the lemures imprisoned in their cages. Several were unleashed on the docks and dozens of bystanders were critically injured. With nothing but a gaff hook to defend himself, Val single-handedly bested two of the lemures in order to protect his fellow workers. The encounter ended when Hellknights from the Order of the Scourge arrived on scene and killed the last of the lemures. Having heard of Val's remarkable battle—and survival—at such a young age, he was sponsored by a member of the Order of the Scourge to join the Hellknights as an armiger and be removed from his indentured servitude. For the next decade, Val would diligently serve the Order of the Scourge before being cycled into the Order of the Pike as concern in Ergorian grew over the burgeoning tiefling presence in the city. Val, along with thirty other Hellknights, traveled to Senara to join Lictor Ghaldurn in observance of Senara and the Whisperwood. It was here that Val first met Master of Blades Tolsis Tuvadorn, a cunning and well-spoken half-orc hailing from Isger. Frequently assigned to perform scouting operations in the Whisperwood, Val and Tolsis became fast friends and trusted comrades, which ultimately led to the ultimate act of sacrifice when Tolsis intentionally failed part of her trial to be appointed as Lictor following Ghaldurn's death, allowing Val to take the title for the betterment of Senara. Val Athraden is a calm and even-handed soldier. Having known little life other than in service to the Hellknights, he takes pride in his duty alone. In the off hours where he does not need to perform the duties of his station, Val often finds himself without comfort. Time with only his thoughts is troubling, and Val handles being alone poorly.It is because of this that he has long kept the company of Tolsis Tuvadorn, a relationship that—were he capable of forming emotional bonds—may have become romantic. Instead, Val sees Tolsis as an indispensable ally with a sound mind for tactics and leadership. While he understands her decision to ensure his appointment as Lictor, he sees Tolsis as a better leader than himself. Lictor Athraden does not trust the recent arrival from Ergorian—Esreth Paerta—and believes the diabolist is serving neither the Hellknights nor the crown in her research into the supernatural occurrences in Senara. Though he cannot prove this suspicion, both Tolsis and Fianna agree that the diabolist is hiding something, and her insistence on opening the sealed door below Citadel Ordeial troubles them greatly. Tolsis Tuvadorn was born into the world in fire and screams. Her family's farmstead on the outskirts of Logas in Isger was attacked by a goblin raiding party on the eve of her birth. The goblin attack set fire to dozens of homes and hundreds of acres of farmland, including the Tuvadorn farm. Though her parents were able to see their daughter born, hiding from the attack in their barn, that moment was the last time the three were together as a family. Tolsis' mother, an exiled half-orc shaman from Belkzen, died in childbirth. Her father, little more than a farmer and shepherd, swaddled his newborn daughter in his arms and attempted to flee the burning farmland on foot with the hopes of reaching a militia garrison up the road, but was struck down just a half mile from the garrison by a goblin archer. Just moments after his death, Hellknights from the Order of the Pike rode out to the farmlands from the militia garrison to aid in driving back the raiding party. Tolsis was discovered by a member of the order and brought to Logas to be raised in a foster home. Growing up in orphanages, Tolsis was quick to apply to the Order of the Pike once she was old enough to hold a spear. Long had Tolsis harbored a sense of debt to the Hellknights for saving her from certain death, but she also held them to failure at being unable to reach her family in time to prevent their deaths. Instead of letting that bitter sentiment fester, Tolsis turned it into a driving force to better the Order of the Pike with her own hands. Initially turned away by the order due to her young age, Tolsis instead joined the Logas militia and trained for six years before finally reapplying to the Order of the Pike. On becoming an armiger, Tolsis used the greater resources of the Hellknights to expand her understanding of warfare and battlefield tactics, growing her value to the Hellknights and by extension their efficacy. When offered a promotion to Master of Blades in exchange for leaving Isger to reinforce the Order of the Pike at their headquarters in Senara, Tolsis gladly accepted. The opportunity to expand her horizons and serve at one of the most dangerous fortifications the Order of the Pike maintains was an opportunity she could not pass up. Though Tolsis initially harbored no love for the people of Senara and their narrow-minded ways, she realized that the prejudice she encountered due to her race was insignificant in comparison to the plight of the Senaran tieflings. But when Tolsis stood in line to be appointed as Lictor of the Order of the Pike following Lictor Ghaldurn's death, it was this realization of the racially divisive nature of Senara that informed her decision to stand aside. Choosing to fail her final examination in favor of Val Athraden, Tolsis realized that there were ways to better the Order of the Pike's worth that did not require her direct involvement. Though some among the order misconstrue her relationship with Athraden as romantic, neither she nor the Lictor feel that way about one another, but instead maintain a strong and professional bond based on a foundation of respect. Tolsis is a ferociously intelligent and cunning officer among the Hellknights, known for her level-headedness and eloquence. She is fiercely loyal to the order and defensive of their accomplishments, especially the institution of martial law in Senara. Tolsis has little tolerance for bigotry or racism, having endured both for most of her life. Aside from her position as a tactical advisor to Lictor Athraden, Tolsis is also an avid cartographer and continues to work on updating the Order of the Pike's maps of the Whisperwood. Additionally, she maintains a bounty program for adventurers and mercenaries who hunt monsters in the Whisperwood. Though, less famously, she also pays well for charts and maps of the forest interior and undiscovered landmarks. Of all the members of the Order of the Pike in Senara, Fianna Ru'am is known as the most unlikely of all Hellknights. At 96 years of age, Fianna has lived through much of Senara's troubled past, having come to settle in the city after the passing of its current high priest of Pharasma. Originally hailing from Westcrown, Fianna was abandoned by her family after the initial expression of her oracular gifts. Unable to raise a supernaturally gifted child, Fianna was offered to a convent of Pharasmin priests and was trained in this solemn environment to harness and control her governance of life and death. Eventually, Fianna moved to Ergorian to serve as midwife to noble families along with her church-related duties. When word of the passing of Senara's high priest of Pharasma reached Ergorian, Fianna was selected to become his replacement, a duty that she quietly and humbly accepted. The eve of the riots of 4638 thrust the otherwise reserved oracle into the forefront. Realizing that Senara would tear itself apart if nothing would be done, Fianna worked in conjunction with the priests from the Temple of Iomedae to put an end to the conflict and seek diplomatic resolution. Then high priest of Iomedae, Alvis Gavorn, joined Fianna at the front of the worst of the rioting. Together, the pair wove powerful enchantment magic to calm the rage of the townspeople, manipulating their emotions long enough to get them to see the damage they were causing Senara and to listen to reason. While the decision to create the tiefling ghetto, now known as the Stakes, was not Fianna's idea she supported it none the less in the hopes that the segregation might be enough of a buffer to ease the growing tensions. In the years that have come since, Fianna has regretted her involvement with the creation of the Stakes, having seen the deplorable conditions the tieflings are forced to live in. When the Order of the Pike returned to Senara in 4688 Fianna—as the oldest living resident of Senara—offered to join the Hellknights as a Signifer in order to serve as a bridge between the common people of the city and the Hellknights. Initially the rationale behind Fianna's decision seemed uncertain, but following the declaration of martial law by the Hellknights years later, she became an important mouthpiece of the people within the Hellknights, advocating for less strict regulations of curfew and travel which has allowed Senara to continue to flourish under Hellknight rule. Some have come to speculate as to whether Fianna may have seen the events of the military takeover coming through divination or oracular inspiration, though none have openly suggested it. To the people of Senara, Fianna is the lynchpin that holds the city together. She is a binding factor between Hellknight and citizen, always looking out for the people of Senara's best interests. This agenda may have afforded Fianna trouble among the Hellknights, but her skill as a healer and level-headed counsel has time and again proven her worth to her peers in the order. Though it is clear that Fianna's true allegiances lie not with the Hellknights, but with Senara. Senara's most well-known scoundrel, Graiden Horst has claimed to be a pirate that served the Hurricane King of the Shackles, a tomb raider that plundered riches from the Sodden Lands to Osirion. Few know the real Graiden Horst, and that is exactly how he prefers to keep it. Graiden is a storyteller and student of magic hailing from Varisia, born in a caravan and raised on heroic stories of legend. While he has, on occasion, set foot in a dungeon and crept through a forgotten Thassilonian ruin in his homeland, these were fleeting glimpses of adventure in an otherwise more mundane life. Some of Graiden's most bold boasts are based on stories told around the campfire when he was just a boy. Graiden came to Senara after the death of his parents to illness when he was twenty-six. Leaving his caravan and his past behind, Graiden intended to start up a new life. Traveling south through Korvosa, Graiden spent a little time in Isger before continuing south into Cheliax, following tales of the city of Senara. Graiden was attracted to the city by tales of mystery centered around the birth of tiefling children. He had heard similar stories about the prominence of their births—along with aasimar—in the years following the death of Aroden and was enticed by the opportunity to witness history unfolding for himself. He purchased the Stolen Eye from the town under the condition that he refurbish the decrepit structure, branding it after a story told by his parents of adventurer-thieves that stole the ruby eyes of a kobold god. While Graiden's version that fashions himself as the daring hero is wholly a fabrication, there is a part of him that desires one real adventure before becoming an old man. While Graiden is content to entertain the people of Senara and take their money, he secretly hopes that the tumultuous history of the city leads him to the adventure he's been yearning for. To this end, Graiden has been keeping an ear to the ground with regards to the Hellknights research of the troubling dreams—ones Graiden himself has yet to experience—and rumors that the recently arrived diabolist from Ergorian wants to delve below the city. Without mage armor and shield, Esreth's statistics are AC 11, touch 11, flat-footed 11. The real Esreth Paerta died six years ago when her carriage was ambushed en route from Westcrown to Ergorian. A Chelaxian noble of little renown or importance that dabbled in wizardry, Esreth was supplanted by a Nidalese spy in service to the Umbral Court in order to gain an additional eye into the royal court of the Chelish capital. Esreth long ago shed her true identity, consumed by her devotion to the role of Esreth Paerta. With the real Esreth's largely estranged family living in Westcrown, her usurper was free to utilize her family name's recognition at the capital to engender herself to the Chelish aristocracy. Esreth was indoctrinated into the a diabolist coven after years of living among the nobility of Ergorian, acting as an otherwise benign observer among the secret depredations of the Chelish nobility. Quietly, she was amassing a collection of information regarding the hedonistic acts and desires of Ergorian's elite whom utilized diabolism to accent their outrageous parties and twisted dalliances with the infernal. It was by chance that Esreth learned of the situation in Senara, an otherwise remote and unimportant city. Her research into Senara in Ergorian revealed to her a fraction of the city's ancient history and connection to the powers of Hell itself. Modern Cheliax had forgotten the pains gone through in order to secure house Thrune's alliance with Hell and the missteps that were made along the way. The secrecy of diabolism in the old ages before the death of Aroden ensured that some records were all-together lost or forgotten. Esreth had found herself in the right place at the right time to learn of Senara's placement in that history and of its role as a resting place to an entity she believes to be an unknown Infernal Duke. Esreth was quick to use her influence in the capital to receive official placement as a researcher for the crown in Senara on the matter of the tiefling population boom. With her knowledge of Senara's history at hand, Esreth became aware of the nearby proximity of the green dragon Athervox as well, an enemy to House Thrune but useful font of knowledge. Once set up in Senara, Esreth began to form hypothesis regarding the nature of the tiefling births and she believes them to be connected to the exiled Infernal Duke trapped below Senara. Unfortunately for Esreth, she is not completely certain that the records are accurate in depicting who—or what—may lie below Senara. But it is in the best interests of the Umbral Court to ensure that it is neither a threat to Nidal nor an opportunity left untouched. In order to further her research, Esreth is openly requesting assistance from adventurers in exploring the catacombs beneath Citadel Ordeial which she believes may connect to the site of the lost Infernal Duke's prison. Though she keeps any knowledge of what may lie below Senara to herself. Less openly, Esreth is seeking a spy to scout Athervox's tower for information not taken by House Thrune when they betrayed the dragon centuries ago and is considering courting Graiden Horst for the job. Lastly, Esreth is enamored by the stories of nightmares and vivid waking dreams experienced by some of Senara's human residents and is looking for a way in which to discretely experiment on them for further information. To this end, she has constructed holding cells in the basement of her library for just the right specimen, once one presents itself. The tiefling Ishria presents herself as a Senaran native, one of six hundred tieflings living within the ghetto of the Stakes. The truth is that Ishria hails from Westcrown, an operative of a secretive sect of adherants to the goddess of rebellions, Milani. Ishria came to Senara seven years ago to infiltrate the Stakes and look for a way to help the tieflings rise up from their position as second-class citizens. With the instatement of martial law in Senara, she has become obsessed with the notion of overthrowing the Hellknight's rule of the city and—if necessary—driving the Hellknights out of Senara entirely. Ishria is a good-natured person, but has become blind to the troubles surrounding her in her single-minded quest to better the lives of her tiefling peers. Having lived on the streets of Westcrown in its ruined northern district of Parego Dospera for much of her life, Ishria sees Senara as an opportunity to right the wrongs she suffered as a youth. But while working to build a close-knit organization of like-minded tieflings within the Stakes, she has failed to see the danger represented by one of her most vocal supporters, a tiefling by the name of Wuthrud. Ishia met Wuthrud in her first year in Senara, a charismatic and strong mercenary selling his services to the highest bidder. Wuthrud won Ishria over with feigned nobility and interest in the plight of their people. Unaware of Wuthrud's actions, Ishria has come to count on him for protection and counsel on the building of a tiefling revolution. When among humans, Ishria is a soft-spoken and humble tiefling who'se very appearance shows a life born of hardships. Scars criscross her face and the thick, ramlike horns she proudly displays bear deep scars and gouges from conflicts in the past. Among her own kind, Ishria is a vibrant and energetic woman who speaks passionately about the inherent goodness in tieflings and their potential to rise above the infernal seed they were spawned from. She is not concerned with the reasons behind Senara's tiefling surge, but instead sees it as an opportunity to form a foundation for a tiefling settlement, whether within Cheliax or elsewhere. Her idealism and stubbornness allows those sympathetic to her cause to slip past her normally guarded exterior. Should she become aware of the plans Wuthrud is making Ishia will likely seek to confront him herself, an eventuality that Wuthrud has planned for and—in a way—is counting on. Born in the Stakes, the tiefling mercenary Wuthrud watched his mother beaten to death by a pair of angry, drunken militia men when he was nine years old. Following that, he watched his father gradually sink into a spiral of depression and alcoholism, culminating in his suicide before Wuthrud's sixteenth birthday. Wuthrud was raised by his peers; rough and streetwise tiefling youths. He earned his living stealing from merchants, avoiding the militia, and staying out of the Hellknights' way. As an adult, Wuthrud thought to leave Senara, setting himself up as a mercenary and traveling southern Isger as a sellsword, fighting bandits, goblins, and occasionally regressing back to his old ways when the right fat-pocketed merchant was lazy about security on the road. Finding no happiness in this lifestyle and haunted by the memory of his mother's brutal death, Wuthrud returned to Senara at a time when the tiefling community was uniting around the hopeful and kind words of a young tiefling woman named Ishia. For a brief while, Wuthrud put aside his hatred for humanity and allowed himself to experience something that might have blossomed into love. The flower of romance was stamped flat when Wuthrud witnessed the Hellknight overthrow of the government first-hand and learned of the militia's plan to raid the Stakes that instigated the overthrow. Realizing that there could be no happiness for his people as long as they were content to live in the shadow of humans, Wuthrud threw himself in to Ishia's plans for revolution. Ultimately, Wuthrud realized that Ishia's plans of a peaceful tiefling uprising and migration to a settlement for their own kind was both idealistic and unrealistic. Using the inroads that Ishia made, Wuthrud began setting the stage of an armed tiefling uprising of Senara, one that would topple the Hellknights, slaughter the militia, and drive every non-tiefling out of the city. Using the money he gained as a mercenary Wuthrud forged an alliance with Lothan Wodris, owner of the Muddywater Smithy, to forge weapons and armor for the people of the Stakes. While keeping Lothan in the dark about the nature of his work, Wuthrad has been steadily amassing power among those who feel Ishia's plan for a revolution isn't going far enough. None, however, are aware that Wuthrud's ultimate goal ends with the massacre of the militia and as many townspeople as he can manage. He has no allusions of building a better home for his people, but could well become another tyrant on a bloodied throne if allowed to see his plans brought to fruition. The Sleeper: Somewhere below Senara, deep within the crystalline caverns and volcanic springs, there lies an extraplanar entity entombed since before the Age of Darkness. This slumbering entity has been struggling against its bonds for thousands of years. Decades before the death of Aroden, House Thrune made an attempt to contact this power, believing it to be an imprisoned Infernal Duke that they could bargain with for influence and power. But the force trapped below Senara destroyed the minds of the diabolists attempting to commune with it and stirred in its prison. Thrune inadvertantly awoke the beast below, and now its own terrible nightmares are seeping out into the human population of Senara and fragments of its diabolical will twist and corrupt those born within the city, turning them into tieflings. Esreth Paerta believes that the entity imprisoned below Senara is a kyton demagogue from a time before their kind's exodus to the Plane of Shadow, when all kytons were children of Hell. To confirm these suspicions, she is seeking to send adventurers down into the caves where Thrune first made contact with this entity, via a pathway sealed long ago below Citadel Ordeial. Blood of Revolution: Tiefling revolutionaries Ishia and Wuthrud are nearing the time of providence, when the tieflings of Senara throw off the shackles of opporession and seek freedom and a new start. Ishia yearns for the tieflings to rebel against the Hellknights with words and reason, to be allowed to resettle in the Whisperwood and form a city all their own. But her peaceful ways are undercut by Wuthrud, who looks to cause a bloody massacre in Senara in revenge for a lifetime of suffering at the heel of his human "betters." Athervox's Revenge: Centuries ago House Thrune made a terrible deal with the green dragon Athervox, a slight that she has contemplated for years within her tower nestled within the Whisperwood. Hearing of Senara teetering on the brink of chaos, Athervox is looking for agents to tip the scales in her favor, to see Senara undone and allow her time to study the infernal energies suffusing the town in peace.